شوری یکی از مهم‌ترین و متداول‌ترین تنش‌های محیطی در سطح جهان و ازجمله ایران محسوب می‌شود که عملکرد کمی و کیفی بسیاری از محصولات زراعی و باغی را تحت تأثیر قرار می‌دهد. به‌منظور بررسی اثر سطوح مختلف تنش شوری بر تعدادی از صفات فیزیولوژیک گیاه زعفران آزمایشی در قالب طرح کاملاً تصادفی با 4 تکرار و 6 تیمار (شامل هدایت‌های الکتریکی صفر، 2، 4، 6، 8 و 10 دسی‌زیمنس بر متر) در سال 1391 در دانشگاه ملایر انجام شد. بر اساس نتایج به‌دست آمده، اثر تنش شوری بر میزان کلروفیل a و b در سطح 5 درصد معنی‌دار نبود. با این وجود تا هدایت الکتریکی 6 دسی زیمنس بر متر، میزان کلروفیل a و b افزایش و بعد از آن با افزایش سطوح شوری روند کاهشی داشت. تنش شوری تأثیر معنی‌داری بر میزان کاروتنوئید و گزانتوفیل داشت و با افزایش سطح شوری میزان این رنگیزه‌ها افزایش یافت. اثر تنش شوری بر میزان اسید‌آمینه پرولین برگ معنی‌دار نبود. با این‌حال، مقدار پرولین تا هدایت الکتریکی 4 دسی‌زیمنس بر متر روند افزایشی و بعد از آن با افزایش شوری روند کاهشی داشت. اثر تنش شوری بر میزان گلوکز موجود در برگ زعفران معنی‌دار بود و میزان گلوکز به‌صورت معنی‌داری تحت تأثیر تیمارهای شوری افزایش یافت. براساس نتایج بدست آمده اثر تنش شوری بر تعداد برگ زعفران معنی دار نبود ولی اثر تیمارهای آزمایشی بر طول برگ و همچنین وزن خشک برگ در هر بوته معنی دار بود. یک رابطه خطی و منفی بین میزان شوری و محتوی نسبی آب برگ زعفران مشاهده شد و با افزایش شدت تنش شوری محتوی نسبی آب برگ به صورت معنی داری کاهش یافت. با افزایش شدت تنش شوری میانگین وزن بنه‌ها به صورت معنی داری کاهش یافت در حالی که با افزایش شدت تنش شوری تا حد 4 دسی زیمنس بر متر تعداد بنه‌ها افزایش و پس از آن به صورت معنی داری کاهش یافت. Salinity is a common stress in many parts of the world especially in Iran that decreases the yield and quality of many crops. In order to investigate the effects of different levels of salinity stress on some physiological indices of saffron, an experiment was conducted in the Malayer University in 2012. The experiment was arranged based on a completely randomized design (CRD) with four replications and six levels of salinity (i.e. 0, 2, 4, 6, 8 and 10 dS m-1). The results showed that the effect of salinity on chlorophyll a and chlorophyll b content was not significant. However, increasing the salinity stress up to 6 dS m-1 resulted in an increase of these photosynthetic pigments. The effect of salinity stress on leaf carotenoides and xantophyll content were significant and higher salinity stress resulted in an increase of these pigments. Moreover, the effect of salinity on leaf proline was not significant, but the amount of leaf glucose content increased by increasing salinity stress, significantly. The effects of experimental treatments on leaf dry weight, leaf length and relative water content were significant and negative, but there was no significant effect on leaf number. By increasing the concentration of salt, the mean weight of replacement corms decreased significantly whereas the corms number increased up to 4 dS.m-1 and then decreased significantly. Ahmadi, S.H., and Niazi Ardekani, J. 2006. The effect of water salinity on growth and physiological stages of eight Canola (Brassica napus) cultivars. Irrigation Science. 25:11–20. (In Persian with English Summary). Arnon, D.I. 1949. Copper enzymes in isolated chloroplasts. Polyphennol oxidase in Beta vulgaris. Plant Physiology. 24:150-151. Asch, F., Dingkuhn, M., and Droffling, K. 2000. Salinity increases CO2 assimilation but reduces growth in field growth irrigated rice. Plant and Soil. 218:1-10. Ashraf, M. 2004. Some important physiological selection criteria for salt tolerance in plants. Flora - Morphology, Distribution, Functional Ecology of Plants. 199:361-376. Ashraf, M., and Rasul, E. 1988. Salt tolerance of mung bean at two growth stage. Plant and Soil. 110:63-67. Aspinall, D., and Paleg, L.G. 2000. Proline accumulation, physiological aspects. In: the physiology and biochemistry of drought resistance in plants. Academic Press.New York. 206-240. Avarseji, Z., Kafi, M., Sabet Teimouri, M., and Orooji, K. 2013. Investigation of salinity stress and potassium levels on morphophysiological characteristics of saffron. Journal of Plant Nutrition. 36: 299-310. Bajji, M., Lutts, S., and Kinet, J.M. 2001. Water deficit effects on solute contribution to osmotic adjustment as a function of leaf ageing in three durum wheat (Triticum durum Desf.) cultivars performing differently in arid conditions. Plant Science. 160:669-681. Bates, L.S., Waldern, R.P., and Tear, I.D. 1973. Rapid determination of free proline for water stress studies. Plant and Soil. 39:207-207. Bybordi, A., Tabatabaei, S.J., and Ahmadev, A. 2010. Effect of salinity on the growth and peroxidase and IAA oxidase activities in canola. Journalof Food, Agriculture & Environment. 8(1):109-112. (In Persian with English Summary). Cameron, R. W. F., Harrison-Murray, R. S., and Scott, M. A. 1999. The use of controlled water stress to manipulate growth of container grown Rhododendron cv. Hoppy. Journal of Horticultural Science and Biotechnology. 74: 161–169. Cheruth, A.J., and Azooz, M.M. 2009. Exogenous calcium alters pigment composition, γ-glutamyl kinase and proline oxidase activities in salt-stressed Withania somnifera. Plant Omics Journal. 2(2):85-90. Chinnusamy, V., Jagendorf, A., and Zhu, JK. 2005. Understanding and improving salt tolerance in plants. Crop Science. 45:437-448. Gholami Touranposhti, M., Maghsoudi Moud, A.A., and Manouchehri Kalantari, Kh. 2005. Salt stress effect on the photosynthetic capacity of three Iranian saffron (Crocus sativus L.) clones. The 4th National Biotechnology Congress of Kerman. Iran. (In Persian with English Summary). Haouala, F., and Sahli, I. 2011. NaCl effects on growth, flowering and bulbing of gladiolus (Gladiolus grandiflorus Hort. ).Revue suisse de viticulture arboriculture horticulture 43(6), 378-383. Iyengar, E.R.R., and Reddy, M.P. 1996. Photosynthesis in highly salt tolerant plants, Handbook of Photosynthesis. Marshal Dekar, Baten Rose, USA. 897-909. Johari Pireivatlou, M. 2010. Effect of soil water stress on yield and proline content of four wheat lines. African. Journal of Biotechnology. 9:36-40. (In Persian with English Summary). Kafi, M. Koocheki, A., Rashed, M. H., and Nassiri, M. 2006. Saffron (Crocus sativusL. ), Production and Processing. Science Publishers, USA. Kafi, M., Borzoei, A., Salehi, M., Kamand, A., Masoomi, A., and Nabati, J. 2009. Environmental stress physiology in plants. Jihad-e-Daneshgahi Mashhad Press. Mashhad, Iran. 502. (In Persian). Khorramdel, S., Ghesh, R., Amin Ghafori, A., and Esmaeilpour, B. 2014. Evaluation of soil texture and superabsorbent polymer impacts on agronomical characteristics and yield of saffron. 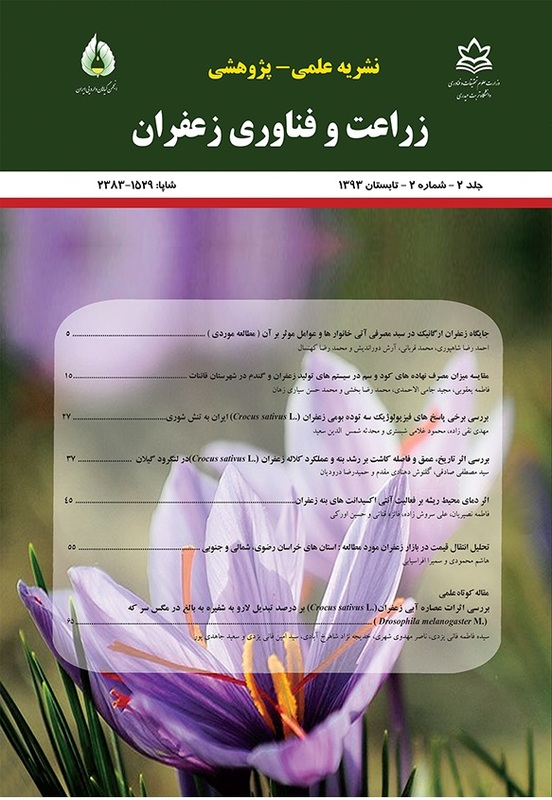 Journal of Saffron Research. 1(2): 120-135. (In Persian with English Summary). Kochert, G. 1978. Carbohaydrate determination by the phenol sulfuric acid method, In Helebust, J.A., Craig, J.S (ed) Handbook physiological methods, Cambridge University Press, Cambridge. 9697. Kumar, V., Shiram, V., Jawali, N., and Shitole, M.G. 2007. Differential response of indica rice genotypes to NaCl stress in relation to physiological and biochemical parameters. Archives of Agronomy and SoilScience. 53(2):581-592. Lechtenberg, M., Schepmann, D., Niehues, M., Hellenbrand, N., Wunsch, B., and Hensel, A. 2008. Quality and functionality of saffron: quality control, species assortment and affinity of extract and isolated saffron compounds to NMDA and σ1 (sigma-1) receptors. Planta Medicinal. 74:764-772. Leopold, A.C., and Willing, R.P. 1984. Evidence for toxicity effects of salts on membranes. In: Staples. R.C, and G.H. Toenniessen (Eds). Salinity Tolerance in Plants. Wiley. New York. 67–76. Mathew, B. 1999. Botany, taxonomy and cytology of Crocus sativus L. and its allies. In saffron Crocus sativus (ed.) Harwood Academoic Puplisher. 19-30. Misra, A.N., Latowski, D., and Strzalka,K. 2006. The xanthophylls cycle activity in Kidnay Bean and Cabbage leaves under salinity stress. Russian Journal of Plant Physiology. 53:102-109. Movahhedy-Dehnavy, M., Modarres-Sanavy, S.A.M., and Mokhtassi-Bidgoli, A. 2009. Foliar application of zinc and manganese improves seed yield and quality of safflower (Carthamus tinctorius L.) grown under water deficit stress. Industrial Crops and Products. 30: 82-92. Munns, R., and Tester, M. 2008. Mechanism of salinity tolerance. The Annual Review of Plant Biology. 59:651-681. Nadian, H., Heydari, M., Gharineh, M.H., and Daneshvar, M.H. 2013. The effect of different levels of sodium chloride and mycorrhizal colonization on growth and uptake P, K and Na by saffron (Crocus sativus L.). International Journal of Agronomy & PlantProduction. 36(2): 49-59. (In Persian with English Summary). Nicolas, M.E., Munns, R., Samarakoon, A.B., and Gifford, R.M. 1993. Elevated carbon dioxide improves the growth of wheat under salinity. Australian Journal of Plant Physiology. 20(3):349- 360. Orabi, S.A., Salman, S.R., and Shalaby, A.F. 2010. Increasing resistance to oxidative damage in cucumber (Cucumis sativus L.) plants by exogenous application of salicylic acid and paclobutrazol. World Journal of Agriculture Science. 6:252-259. Oraei, M., Tabatabaei, S.J., Fallahi, S.J., and Imani, A. 2009. The effects of salinity stress and rootstock on the growth, photosynthetic rate, nutrient and sodium concentrations of almond (Prunus dulcis Mill.). Journal of HorticulturalScience. 23(2):131-140. Parida, A.K., and Das, A.B. 2005. Salt tolerance and salinity effects on plants: a review. Ecotoxicology and Environmental Safety. 60:324-349. Sabet Teimouri, M., Avarseji, Z., and Kafi, M. 2010. Effect of different salinity and potassium levels on saffron (Crocus sativus L.) morphophysiological characteristics. World Food System - A Contribution from Europe. Zurich, Germany. Salehi, M., Koocheki, A., and Nassiri Mahallati, M. 2004. Leaf nitrogen and chlorophyll as indicators for salt stress in wheat. Journal of Iranian Field Crops Research. 2(1):25-33. (In Persian with English Summary). Satoh, R., Nakashima, K., Seki, M., Shinozaki, K., and Yamaguchi-Shinozaki, K. 2002. ACTCAT, a novel cis-acting element for proline and hypo osmolarity-responsive expression of the ProDHgene encoding proline dehydrogenase in Arabidopsis. Plant Physiology. 130:709–719. Torbaghan, M. E., and Ahmadi, M. M. 2011. The effect of salt stress on flower yield and growth parameters of saffron (Crocus sativus L.) in greenhouse condition. International Research Journal of Agricultural Science and Soil Science. 1(10): 421-427.